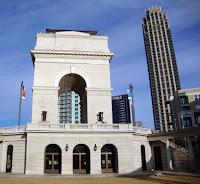 When I started the tourATLANTA blog, I said that I would share my experiences and discoveries while visiting Atlanta's tourist attractions, museums and hidden gems. 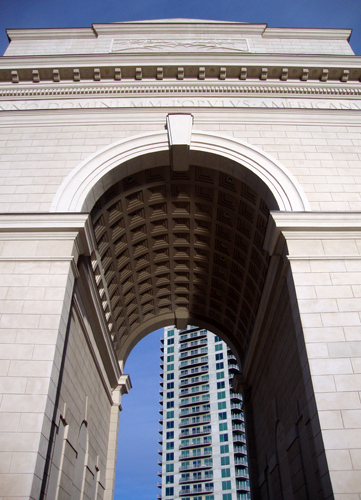 The Millennium Gate is hard to miss, but its role in preserving and sharing Atlanta's rich history is indeed one of the hidden gems I spoke of, but only for now. 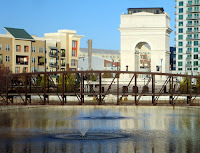 What's inside the Gate is one of Atlanta's best kept secrets…its riches and splendor are definitely worthy of a visit. This post covers visits on two days. The first day was a visit to the grounds. 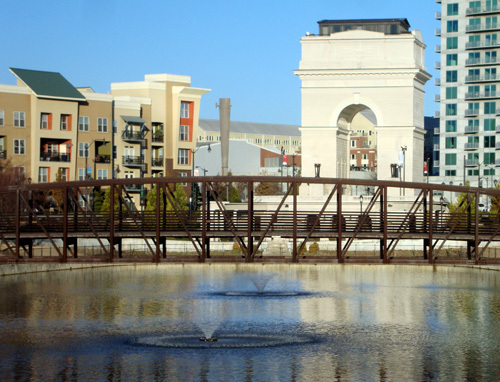 I knew very little about The Millennium Gate, but had seen it quite a few times while driving and when dining in Atlantic Station…my interest was piqued. On the way home from a book lecture at The Breman on Sunday (December 19, 2010), I had some extra time and it was a beautiful sunny day, so I pulled into Atlantic Station via 17th Street to scope out the Gate. Excited to be on an adventure, I quickly found parking and was on my way. Driving by the Gate and walking up to the Gate are two totally difference experiences. On foot, you get to really see the grandeur of the structure…you get to see the thought, hard work, and detail that went into creating such a grand monument. Of course, I was immediately snapping photos. 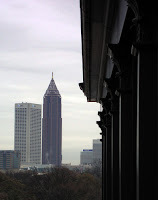 There are some great vistas of the Gate within several blocks and a number of those vantage points puts the Atlanta skyline in the background. When exploring the grounds of the Gate, I noticed several doors on the lake side of the structure. Well, being the curious creature that I am, I went up and peeked in. Shocked at what I saw—museum cases, chandeliers, and information stations—it dawned on me that there must be some kind of visitor center inside the Gate. When I got home, I immediately got on the Internet and discovered that there's more than a visitor center, there's a full-fledged museum! I went back two days later to explore further. The Millennium Gate is fashioned after the Arch of Titus in Rome, Italy. 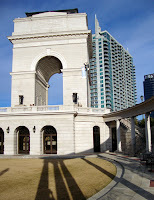 The arch stands 100 feet tall (on the lake side), has seven levels, 12,000 square feet of gallery space, several offices, and an incredible view from its rooftop of Midtown and Downtown Atlanta. The Millennium Gate was dedicated and opened to the public, to much fanfare, on July 4, 2008. The Gate was birthed and is today managed by the National Monuments Foundation, which is also known for the World Athletes Monument in Pershing Point dedicated to competitors of the 1996 Olympics. 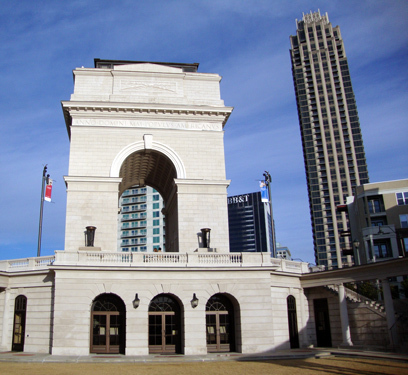 The Gate's exterior is made from Indiana limestone, as is the Georgia Capitol Building in downtown Atlanta. Coincidentally, the Georgia Capitol Building was also dedicated on July 4th, back in 1889. I arrived on Tuesday to visit the Museum and was greeted by Victoria, the Manager of the National Monuments Foundation. She gave me the red carpet treatment. I was escorted to the Museum and given specifics of the Museum layout, including the recommendation to explore the galleries in a clockwise direction. 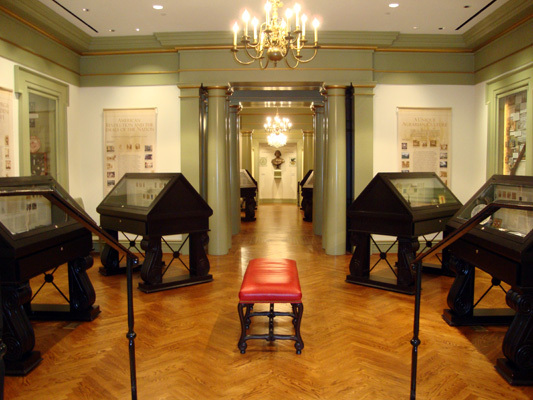 The Museum has several highlights and there's something for everyone. The Museum is comprised of several galleries—one each dedicated to 18th, 19th, and 20th Century Atlanta—as well as several period rooms, a video gallery, and an Interactive Room that features the wildly popular Wii technology. The Interactive Room (a video lounge with Wii technology) is immensely popular with young visitors (and those my age, too). The room has a large format video screen, a podium with a touch screen interface, and Wii paddles that visitors use to explore and discover the city. It's a unique and fun museum experience, to say the least. The Century galleries primarily focus on life in Atlanta, but cover other parts of Georgia as well. Throughout the Museum I discovered more of Atlanta's history (in a succinct fashion) than I’ve seen in any other single place. 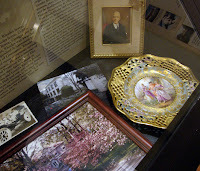 The exhibits and videos focus on Atlanta today and yesteryear, her people, and her neighborhoods. There's far more than I could possibly describe here, but know that you'll want to make ample time to explore and ready yourself for a monumental experience! The Museum is deceptive in size…you would never know that so much information, so many artifacts, so many period rooms, so many galleries and an uber-cool interactive exhibit were all inside the Gate. When Victoria dropped me off in the Museum, she asked me to give her a call when I was done (and I was given all the time I wanted to explore the Museum) and she would take me to the top of the Gate, which is usually by appointment only. More excitement! 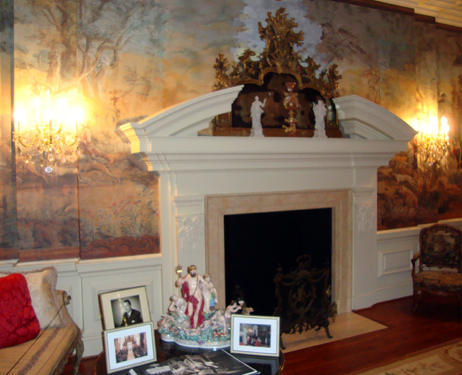 The first stop on the upper level was the 20th Century drawing room of the "Pink House" or "Pink Palace," (called that for its original pink stucco and pink Dogwood tree lined driveway), which was the Rhodes-Robinson home designed by Philip Shutze (who also designed Swan House). This is the largest of the period rooms in the Gate. As soon as I'd finished viewing the drawing room (which is grand by any measure of opulence), Victoria and I were off down the hall when Mr. Rodney Mims Cook, Jr. himself emerged from the doorway we were quickly approaching. Mr. Cook and Victoria discussed business for a moment and then Mr. Cook introduced himself to me and asked what I thought of The Millennium Gate. "I'm impressed!" was the best first statement I could manage to get across my lips realizing that I'd just met the man behind the Gate. We chatted for a couple of minutes, mostly about the Gate and future marketing ideas. Rodney Cook is not only the President of the National Monument Foundation, he was the mastermind behind the creation of The Millennium Gate (He also was the man behind the "Save the Fox" campaign). And as it turns out, he's quite the historian as well. I found myself, much to my delight, in conversation with a man who I believe history will regard as a visionary. Victoria continued on our tour of the top floor of the Gate (the dark brown structure you can see from the ground). 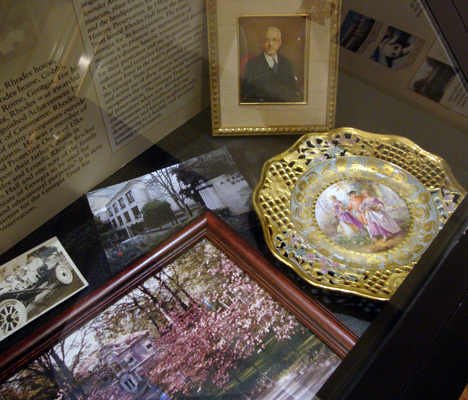 It houses not only the Pink House drawing room, it is also where Mr. Cook's office is located…the "best office in town." I call it the "best office in town" not only because it's one of the very few offices that tourists get to see, but because it has an incredible view of Downtown, Midtown, Lenox, Atlantic Station, and of course Lake Hylia on the Gate's grounds. You'll know you’re there because you just can't miss the Gate when driving down 17th Street in Atlantic Station…it's impossible. Immediately behind the Gate are a large courtyard, paths, benches, and Lake Hylia with an iron bridge across the middle and water fountains. The courtyard has quite a few tables and is a nice place to have the lunch you brought into the office or to bring something that you picked up on the go. You couldn't ask for a more grand setting. There is also a memorial at the far end of the courtyard dedicated to Georgians who fought during past wars and those who lost their lives fighting for human rights. 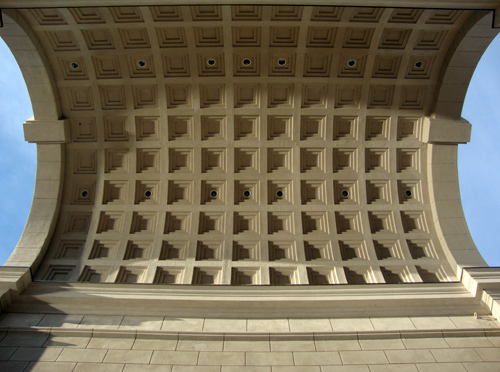 Carved on top of the memorial is a description of The Millennium Gate and its mission statement. At the "entrance" to the Gate, on the street corners just before you get to the Gate there are two bronze statues, one representing Justice (Egypt) and the other representing Peace (Greece). At the far end of the lake there is a great vantage point for making photos, as is the middle of the bridge that spans the lake. The Sunday I visited the Millennium Gate grounds, there was a young couple there with a young lady who had a big camera—a professional photographer I presumed because of the camera and the direction she was giving. The photo shoot was for what I'm sure is to be the young couple's wedding photographs. And the photographers timing was excellent…it was sunset, which offers the most flattering light of any 24-hour period. And the sky was a perfect, cloudless blue. I learned in my research and during my visit that The Millennium Gate facility is available for events and special occasions. I would not be at all surprised to see the same two lovebirds return to The Millennium Gate for their wedding ceremony or reception in the spring. Shall I pass through Atlanta's great portal that is The Millennium Gate once again? Yes, again and again and again. 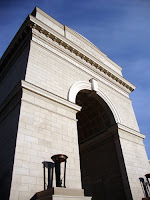 The Gate, the museum, the park…it's a history lesson, it's a respite from the city, it's a monumental must-see! Are all gates alike? This looks remarkably similar to India Gate in New Delhi!